This is the last part of a trilogy, the first of which I read a few years ago. An asteroid strikes the moon and shifts it closer to Earth, causing immense ecological damage. Tsunamis inundate the coasts and volcanoes fill the air with ash. Crops fail and sunlight is a memory. The first part of the trilogy focused on a rural family, the second a brother and sister in New York city, and the third now brings the two together. It’s a short book, probably only 20,000 words, and it didn’t take me long to read. In places, it was rushed and disjointed, and it felt like there were parts that were cut: Characters would suddenly fly into a rage with no reason, then be calm and reasonable a half page later. Pfeffer’s writing style is clean and tidy enough, although some of the dialogue and arguments felt flat. There are endless descriptions of food, the hunt for food, will the food drop arrive, etc. Fair enough, the main character is starving, but could we have skipped over some of her meals? 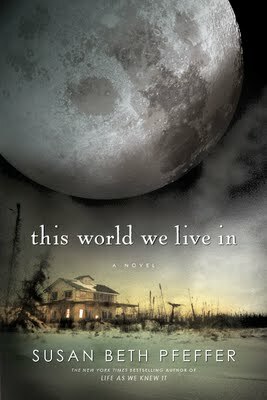 This entry was posted in Reviews and tagged dystopian, Last survivors, review, susan beth pfeffer, this world we live in, tony talbot, YA. Bookmark the permalink.